It's a great time to be in tech, as nearly every industry grows more reliant on technology every year. 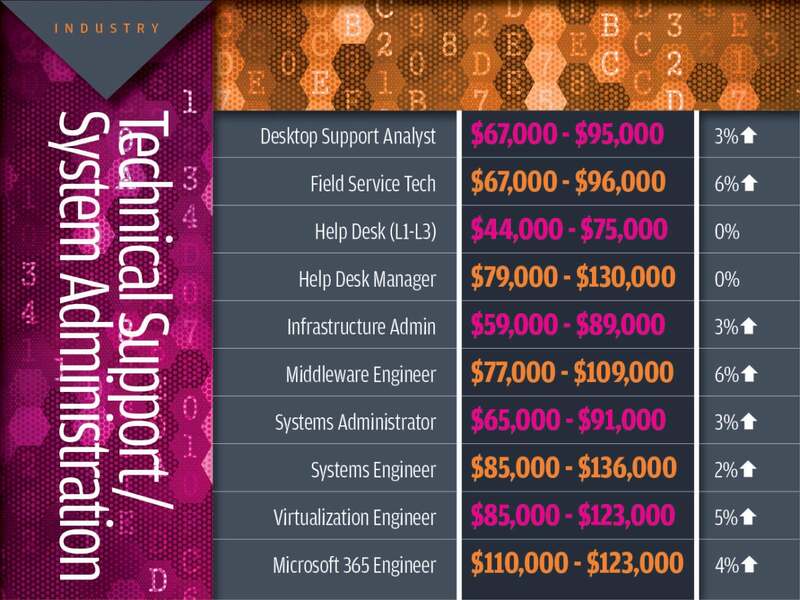 And Mondo's salary survey shows that for tech workers, the average annual compensation is only increasing for these in-demand jobs. 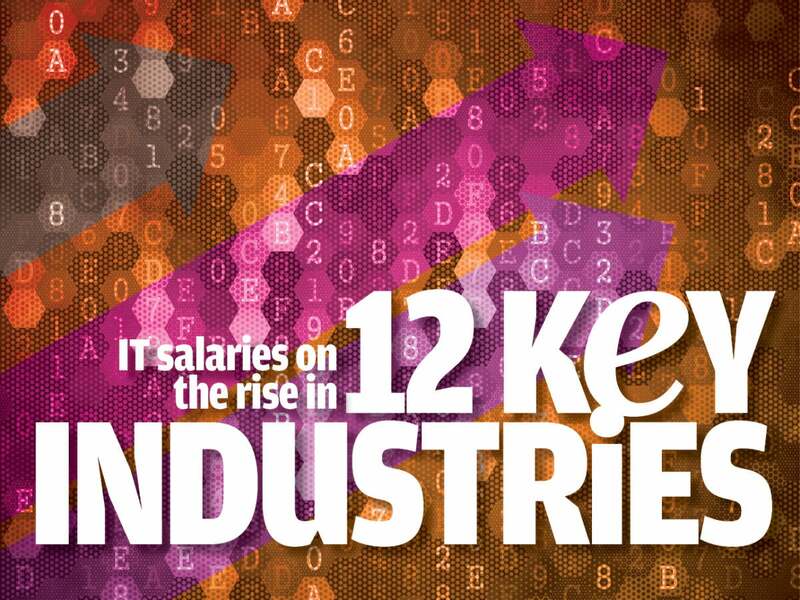 Mondo's 2016-2017 IT Salary Guide points to steady increases in tech salaries across 12 verticals. The study points out that as technology influences every industry, the demand for STEM workers is only going to increase, with a projected 1.5 million open positions in STEM by the year 2020. If you are already in the technology field, or are hoping to break into it, it couldn't be a better time. Mondo tracks the salaries of popular technology jobs to see how the annual compensation range increases year over year and this most recent report shows increases in nearly every tech job evaluated; and for jobs that didn't increase in this report, they at least didn't show a decline in average salary either. 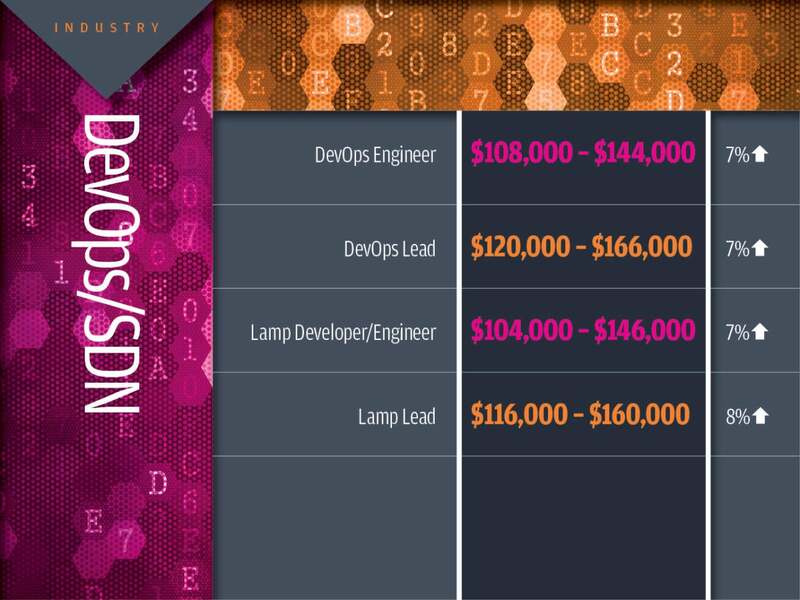 DevOps and Software Defined Networking (SDN) go hand-in-hand as an efficient process to build software with collaboration between software developers and other key players. 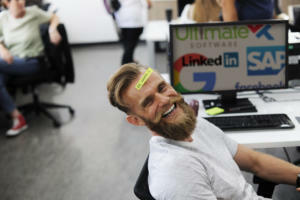 These jobs are a cornerstone to developing quality software by keeping every aspect of the user in mind to create the best experience possible. 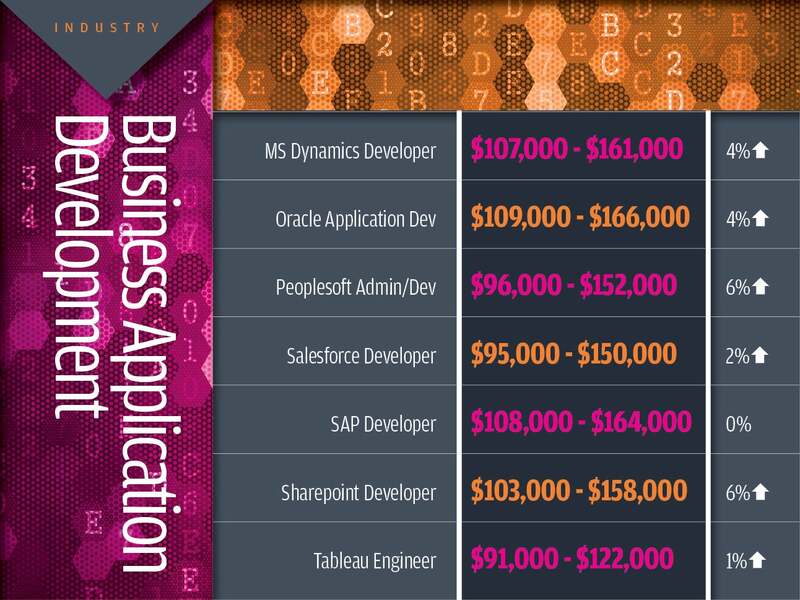 It's a growing field, especially as more businesses decide to deploy mobile, desktop and Web apps either internally or externally, and that demand can be seen in the annual salary increases for job titles in this category. 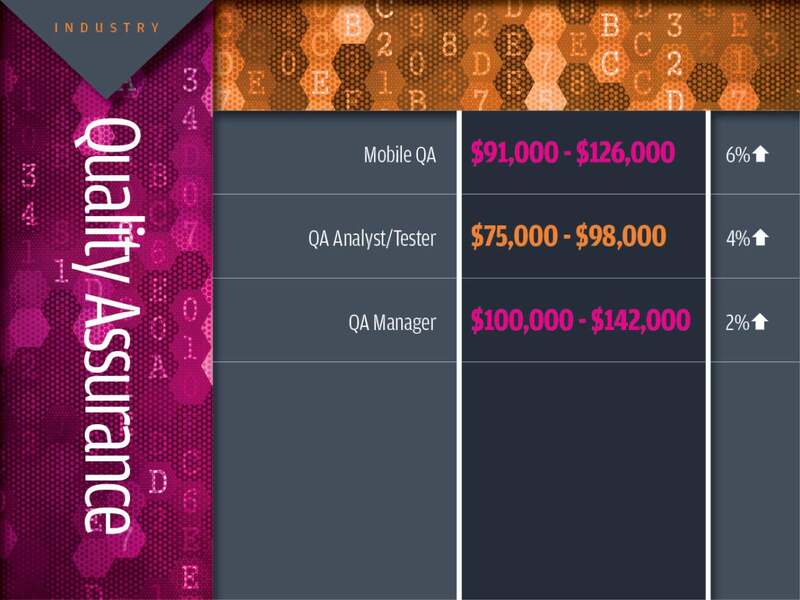 When a company releases a new mobile, Web or desktop app, quality assurance and control are two of the most important aspects before the final product is released. According to Dice, there will be an estimated 100,000 new positions by the year 2022 in this field, especially as Q & A becomes a vital part of any engineering team. 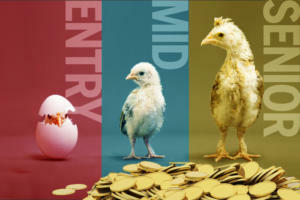 Titles under this category have seen a significant increase in the average salary range, and Dice predicts that growth won't slow down anytime soon. A modern business can't run without the networks that support the technology used day in and day out. That means network administrators are valuable employees at any company, and the average salary reflects that demand. 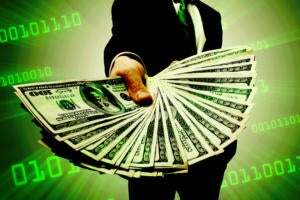 The Bureau of Labor Statistics says that this field will grow 8 percent by the year 2024, with an additional 30,200 jobs on top of the 382,600 jobs recorded in 2014. Security is a hot topic given the high profile data breaches that have made the news in the past few years. 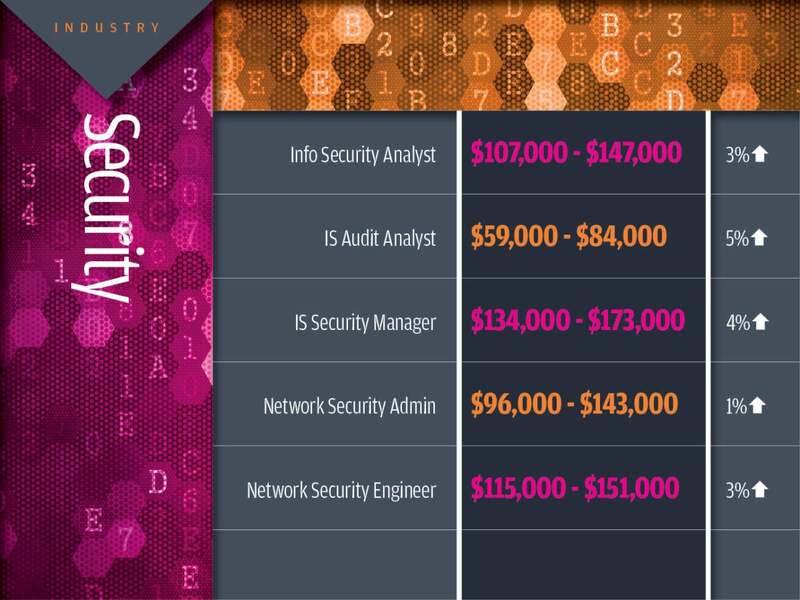 Companies are scrambling to secure their data, which means security professionals are in high demand and the raises in salary certainly suggest this is a fast growing field. 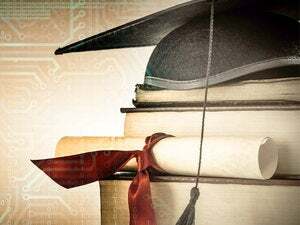 The Bureau of Labor Statistics predicts that jobs in this field will grow 18 percent by the year 2024 in response to the demand for cybersecurity professionals. Just like security, big data has become a major priority for businesses across the country, and it's created a demand for qualified data and cloud professionals. It's also a relatively new field, as data and cloud technology have only recently become hot commodities for businesses. Data and cloud technology span across every industry, according to a report on big data from the Bureau of Labor Statistics, which can often create a skills gap since there aren't enough candidates trained in big data or cloud to go around. 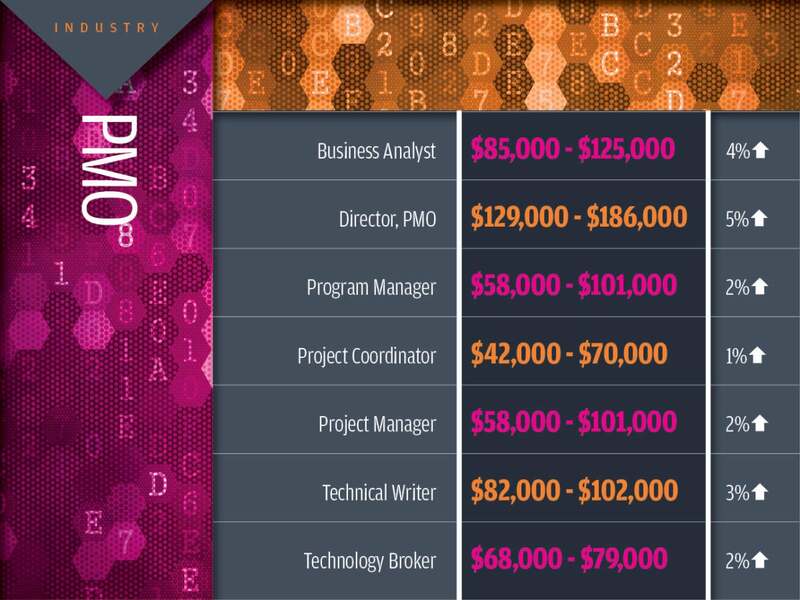 A lot of titles that fall under the category of project management, and according to the data from Mondo, they're all experiencing an increase in annual compensation ranges. 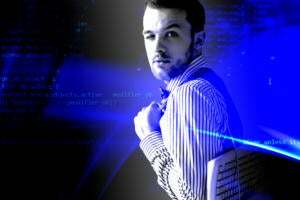 And the Bureau of Labor Statistics predicts that jobs in this category, such as technical writer and business analyst, are expected to grow 10 percent and 14 percent, respectively, by the year 2024. Jobs under this category are experiencing growth not only in available positions, but according to Mondo, they've also seen a rise in average yearly compensation. Technology has helped businesses grow and increase productivity, but with all the new hardware and software entering the enterprise, businesses need the right people to manage them. The Bureau of Labor Statistics predicts that jobs in this field will grow 12 percent by the year 2024, adding 88,800 jobs to the 766,900 positions recorded in 2014. Salaries for titles under this category have mostly increased, save for a couple exceptions, with some roles seeing as much as a five to six percent increases in annual compensation ranges. Every modern business has a website these days, and whether it's for ecommerce, customer interaction or to deliver general information about the company to the public, businesses need a Web developer to manage the site behind the scenes. The Bureau of Labor Statistics predicts that this role is slated to grow 27 percent by 2024, adding an additional 39,500 jobs to the market. It's a fast growing field, and interestingly enough, in 2014 the BLS reported that one in seven Web developers reported being self-employed. Business intelligence jobs revolve around evaluating a business' day to day practices and looking at ways to improve efficiency. It's an especially important role in technology, since the networks, systems and hardware businesses rely on are rapidly changing. According to the Bureau of Labor Statistics, jobs in business intelligence are expected to grow 14 percent by 2024, adding an additional 103,400 jobs onto the 758,000 jobs recorded in 2014. 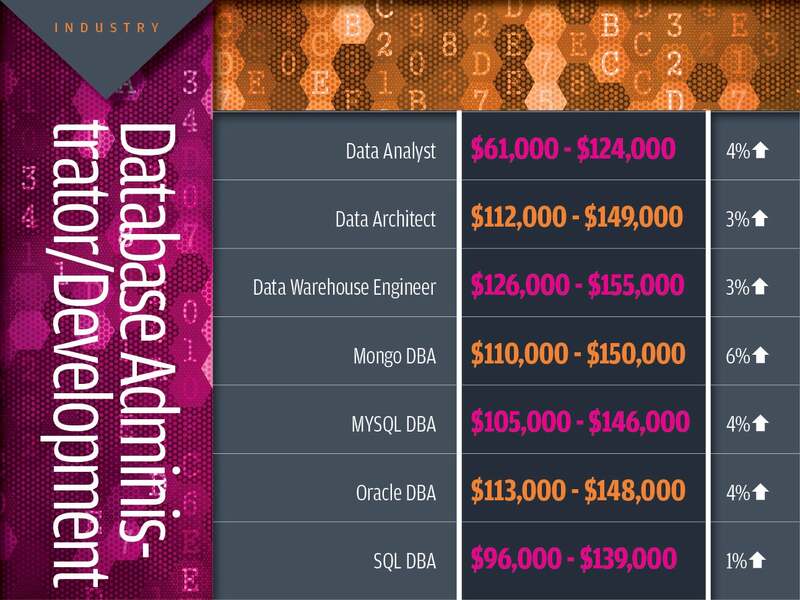 Jobs in database administration and development have seen an increase in salary across the board, with each title under this category seeing anywhere from a one to six percent rise in annual compensation. The Bureau of Labor Statistics predicts that this field will see an 11 percent increase in growth by the year 2024, adding an additional 13,400 jobs on top of the 120,000 jobs recorded in 2014. It's a growing field as data becomes vital to nearly every industry, and businesses need a way to store and protect vast amounts of digital information. 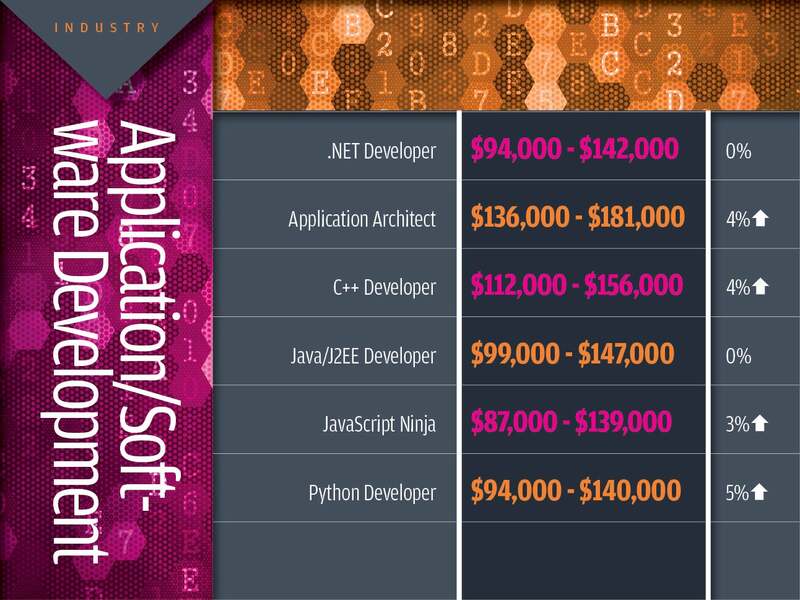 Software development remains a fast growing field, according to the Bureau of Labor Statistics, which predicts a 17 percent growth in software development jobs by 2024. As of 2014, there were 1,114,000 software development jobs in the U.S., and by 2024, there will be a predicted additional 186,600 openings. 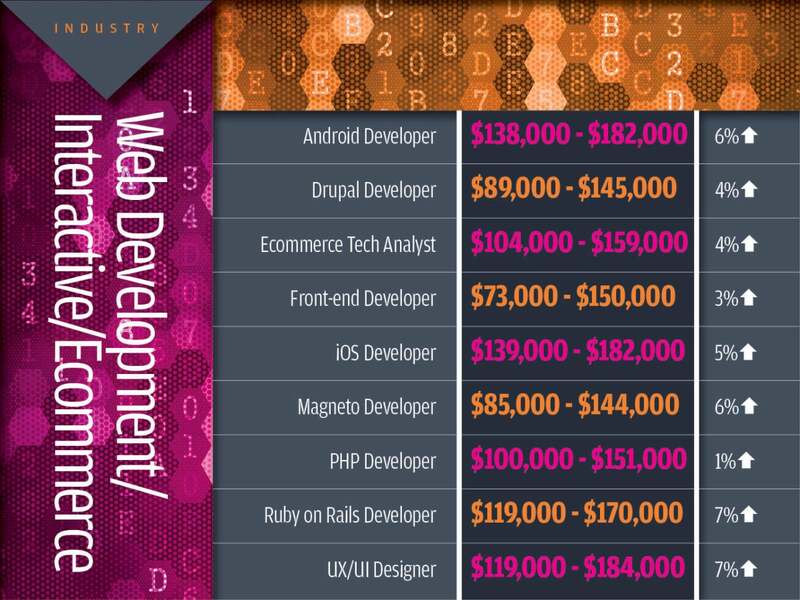 As the demand for computer software grows, so does the need for more developers, which can be seen in the salary increases for most titles that fall under this category. Application development isn't just about consumer apps, more businesses are adopting apps to help increase productivity and efficiency in the enterprise. But just because an app is for internal use, doesn't mean it shouldn't be just as good as an app you'd find in the mobile store on your smartphone or tablet. If you're working in this field, you'll see a rising trend in the average salary, with Mondo reporting salary increases of up to 6 percent for job titles under this category.